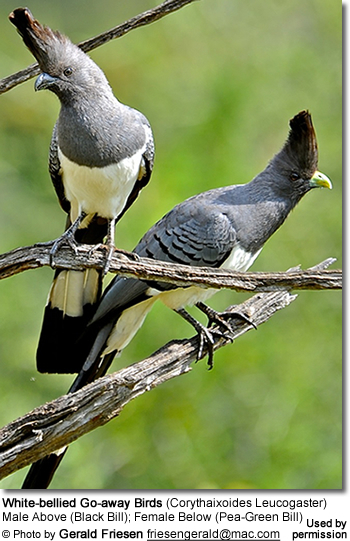 The White-bellied Go-away Birds (Corythaixoides Leucogaster) are non-migratory. They are weak flyers and, therefore, only fly short distances in a dipping motion. They can climb trees and vines and run almost like squirrels over tree limbs. They are often seen single, pairs or small groups. Like other go-away-birds, they got their name because of their sentinel calls that sound like "Go Away." Their voice consists of one or two syllable barks with some longer wailing notes. Their call consists of a loud and nasal "gwaa." When they are calling, it is almost as if they are saying "go-wayeer" - hence their name. Their call is very helpful to prey animals because they will start calling loudly when a predator such as leopards or humans enters the territory. These birds usually fly very noisily from one tree to another. These African turacos are native to Central and South Africa, specifically they can be found in South-east Sudan, Central / Eastern Ethiopia and Somalia through Uganda and Kenya to Tanzania. They prefer dry acacia savannas and well-wooded areas, including gardens.They like to stay deep within the forest. The type of forest varies from the driest thorn bush to evergreens. The Go-Away Bird is medium to large in size. It has a length of about 14 - 29 inches (35 - 75 centimeters) and weighs between 8 ounces and 2 pounds (230 - 950 grams). Its plumage is characterized by the colors gray and white. While the overall plumage is gray, it has a white belly and white bar on its tail and wing that can only be seen only when it is flapping its wings. This bird has a relatively small head and a medium sized neck, giving it a somewhat strange appearance. The crest on the top of its head, along with its facial pattern, help distinguish this species from others. The bill is short and stout and almost in the shape of a human nostril. They have a pointed gray and long black tail with white median band and a distinctive white wing patch that can easily be seen in flight. The feet of this animal are uniquely shaped. The fourth toe is set at right angles to the foot so that it enables the bird to move both forwards and backwards, which helps this turaco run and climb branches with ease. Male and female are alike except for the bill; which is black in the male and green in the female. There are indications that these go-away-birds are social breeders. Even though the parents seem to demonstrate monogamy, groups of these birds organize themselves so that individuals other than the parents contribute to the nesting chores of incubation, brooding and feeding of the chicks. In captivity, this species will nest in simple pairs which, in turn, leads to a very low success rate. Their nests are made of a platform of twigs and is usually located at about 16 - 66 feet (5 to 20 meters) off the ground. For several weeks before egg laying, the male regurgitates fruit pulp for his female. Once proper reproduction has begun, both birds contribute equally to the incubation, brooding, and feeding the chicks. The hen lays 2 to 3 eggs. The colors of the eggs are either a glossy white, or a pale blue/green, which weigh between 0.7 - 1.6 ounces (20-45 grams). The incubation period lasts about 21-24 days and the nestling period is 10-12 days. The whole process lasts about 4 weeks. The chicks advise the parents of their hunger by a large orange-red gape. They feed on regurgitated fruit pulp, and their parents swallow their feces. Independence from parental feeding seems to be gained at about 6 weeks, although the offspring continue to beg long after this age. The chicks are born covered in thick down and with a carpal claw. They often move off the nest and wander the tree before they can fly. They leave the nest after about 10-12 days and can fly after about 30 days. This turaco, like other go-away birds, feed mostly on a wide range of fruits, including berries that are poisonous to man. These birds particularly like plantains, which is why they are often referred to as "plantain eaters." They also feed on few invertebrates, seeds and buds..